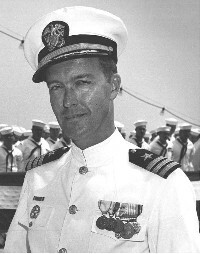 Douglas Robertson, Anderson’s 15th Commanding Officer graduated from the United States Naval Academy class of 1951 where he was commissioned an Ensign and reported to USS Eversole DD789 based in San Diego and Long Beach. While serving in Eversole, he participated in two deployments during the Korean War as gunnery officer. From 1953 to 1957 he served as Executive Officer of LSM 47 in San Diego, and Fire Control Officer of USS Rochester CA 124 in Long Beach. In 1957 Commander Robertson took to the classroom and served as assistant Professor of Naval Science at Northwestern University in Evanston, Il. In 1959, Commander Robertson served as Executive Officer of USS Harveson (DER 316) at Pearl Harbor. From 1960 to 1965, Commander Robertson served at the Fleet Operations Control Center in Hawaii, Joint staff at Seoul Korea, and Executive Officer of the USS Fletcher DD 870 based in Long Beach, and included two deployments to the Tonkin Gulf with Task Force 77.4 at Yankee Station which included incident and retaliatory strikes on South Vietnam. From 1965 to 1966, Commander Robertson served as Surface Warfare Operations Officer for Commander of ASW group three based in Long Beach and embarked in Hornet and Yorktown. This service also included two deployments to the Tonkin Gulf. In 1967 Commander Robertson assumed Command of USS Richard B. Anderson DD786 relieving Captain Ed Alberta. He commanded Anderson through two deployments in Tonkin Gulf operations with Task Force 77 providing gunfire support. In May of 1969, Commander Robertson became Chief Staff Officer for Commander Cruiser Destroyer Flotilla five in Pearl Harbor. From 1972-1976 Commander Robertson served as Staff Commander of the 14th Naval District in Pearl Harbor. In 1976 until his retirement in 1977 Commander Robertson served as Executive Officer of the Fleet Antisubmarine Warfare training center in San Diego where he retired in June of 1977. After Retirement, Commander Robertson was General Manager of Lancer Corporation involved in aerospace engineering. In 1992 Commander Robertson retired his civilian endeavor and keeps busy as a private pilot working with experimental aircraft and maintaining some collectible automobiles in the 1965-1968 era.